Some Mango Memories! | Simple and Delicious ! Do you have some sweet mango memories related to your childhood? If you are born and brought up in a Keralite village, the answer will be definitely yes.Here is the mango season arrived and there are lots of sweet memories going through the mind while seeing raw mangoes falling in the courtyard.The wind was little hasty, so mangoes fell down with branches many times..
What was the easiest way to eat some raw mangoes? Take a clean cloth, (most of the time it was a bath towel, that was stolen from the ayal/ rope used to dry clothes) put mango and salt in that (if you have chilly powder,then it too),hold all the sides of cloth together and make it like a cover, just hit on the walls or trees many times using all your strength, slowly open the cloth, you get crushed pieces of raw mango mixed with salt! Let me take breath... :) This was the mostly eaten dish by us during child hood if it was mango season. The most important thing was that we didn't need anybody's permission to make this since the ingredients were easily available. The other dish, was little more hard to make, as kids it was difficult for us to cut mangoes with a knife. Any way the bigger children in the group did this work. 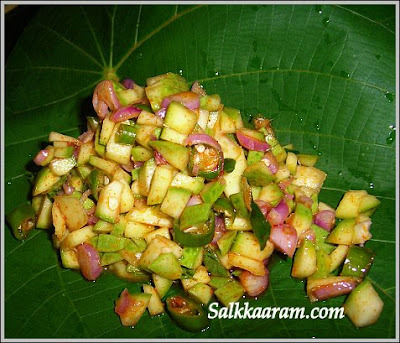 Getting all the ingredients were not easy, but we managed to get each item from different houses.We chopped mangoes as small pieces (kothi ariyuka), mixed it with chopped small onions,green chillies, red chilly powder, salt and coconut oil. The aroma was super, still I can't resist eating it! The method was different for each places, some added curry leaves and some added vinegar. Once when I prepared it , just to show my girl how were we used to make them. Then hubby said, they kept the mixture in the sun for some time "to set", or some times added hot "kanjivellam" in that.He took all mango mixture with plain rice that time. It brought about the pleasant pictures of my class mates, who came home once while coming back after attending a friend's marriage.We all about 7 girls finished one horlicks jar of this mango mixture together in one sit.. :) Every one loves it, if it is a kid or an adult. This is not a pickle and not kept for next day. It should be eaten fresh. The large leaf in the picture, which I served this mango is the leaf of "podi ayni", which is a plant that grows here with coconut trees.In olden times,(before plastic age) it's large leaves used to carry things by foding the leaves carefully.People especially workers in the land used it to carry and eat food, or to cover meat or fish etc. There are some more "mango specials" like manga chammanthy,manga curry, manga achar and manga tholi or manga thol (mango pieces dried in sun), uppu manga etc... Hope to post them later, Insha Allah..
Chop mangoes with skin. Chop finely.Cut other ingreidients too. Mix magoes with them. Add chillie powder , salt and coconut oil. 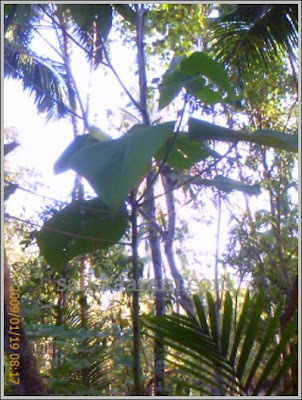 A podi ayni tree near house. As a kid,some exclusive memories are of our maid and her daughter who used to entertain we kids by just plucking raw 'moovandan manga' from the backayard near to the kitchen..Putting the manga on the ammikkalu and directly press/crush them with ammikkallu and now putting salt and chilli into it makes it a different thing...a perfect bliss for anyone..most of these happd during afternoon intervals when the elders go for a nap..ha ha. 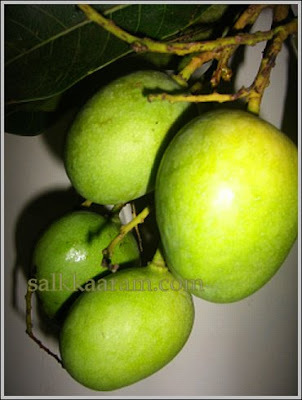 and as a teenager'Mangatholi' was my fav..remember the days swallowing plenty of them with friends..
My mom makes great pickles with both raw mango as well as mangatholi..carried many bottles to hostels and thus spread her culinary expertise from delhi to cochin..
ippo Granma's,amma's okke thanne saranam!!! I love your story of childhood, we only get mangoes in the supermarket here, but I do buy them to make Mango sorbet, which is lovely after dinner, especially if it's curry! I'll be trying the recipe. I totally agree on this post. It took me to my childhood. During the mango season on the way to school a,d back, boys used to throw stones on the mango tree and then they used to gert mangoes for us like that way and we used to eat them. And the main snack during the interval was mango pieces and one or the other kid would have brough salt with chillie powder andwe used to enjoy them. Just writing them makes mu mouth drool and drool. Mixing onion should bring a nice crunch and coconut oil very aromatic this mango... Imagine the goodness of flavor! Lovely post. Never heard of crushing mangoes in the towel but it reminded me of how we used to crush ice cubes that way! Mouth watering mango salad Seena:) I think most of us have some mango memories...we used to search for the fallen mangoes under a mango tree while coming back from the school to home. Hello Seena, first time here! kuttikal aayirunnappo ee prayogam kannimaangayil cheythu thinnan aayirunnu kooduthal thalparyam...am drooling! Check out EFM-Savory sreries round up and join with us in EFM-Microwave Oven series! hey hey..how are you!!! childhood memories alwyas seem to have some mango-effect on every mallu, i beleive! so, hows life with you ?...Seena, are u working there? has the recession been bad on u guys? and , abt the grapes pickle post, what rice have u used to fry? coooked or unccoked? Yeah, Sona, I used uncooked rice.. I love your story of childhood. its a Lovely post. u just made my mouth water!! are u at home then? 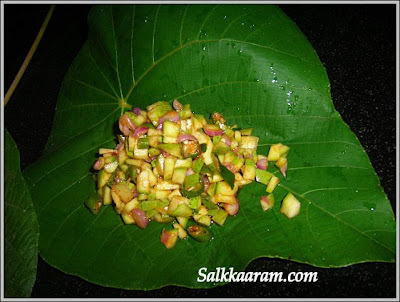 we used to add some puli vellam to the mango.. no cheriya ulli.. each one is unique, isin't it? its very tempting. but sorry this is not mango season for me.